Fensys balustrade products are produced with a high grade UPVC thermoplastic cap layer onto a commercial grade partly recycled base. The cap layer provides excellent weatherability whist the base layer delivers a greener recycled element. 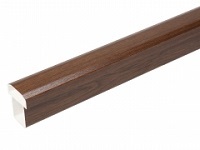 Wood grain effect balustrade finishes such as green, grey, rustic oak and golden oak are all produced using the same type of outdoor grade technical plastic film as double glazed window frames. 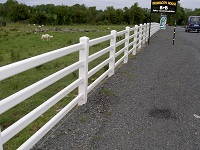 Fensys Ranch style UPVC plastic fencing is available in white, cream, beige, golden oak, rustic oak, green and gayle grey. Design options – Fensys fencing products are available with many bespoke options including glass panels, bowed pickets, alternate picket sizes and variable picket spacing (standard 70mm – 90mm). 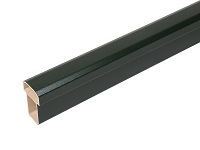 Fensys hand rails are available in 3 styles to suit all applications. All are available with galvanised steel reinforcement and all are available as a bracket based or routed systems. Our fence post measures 102mm x 102mm and can be supplied plain or routed either with or without galvanised steel reinforcement. More product information can be viewed by downloading our literature. All polymer products are manufactured by PAL GROUP (operations) LIMITED under the controls of BS EN ISO 9002 quality standard. A copy of our ISO 9002 certificate is available on request. Fensys 100% polymer and steel products only are covered by a 10 year limited warranty. 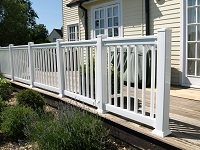 Composite materials are covered by our 2 year limited warranty. Copies of these warranties are available on request. 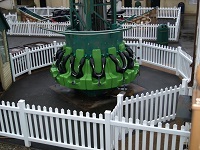 All Fensys products are designed to require very little maintenance; Fensys polymer products can be cleaned with lightly soaped water and the occasional jet wash. Fensys polymer products do not need painting, sanding or sealing. Many of our products include a recycled element. Using polymer skinning technology, products can contain up to 70% recycled material, partly generated through utilisation of our own in house recycling plant. Fensys polymers have been tested by Fire Technology Services (a UKAS accredited company) in accordance with BS 476: Part 7: 1987 (Method for classification of the surface spread of flame of products). 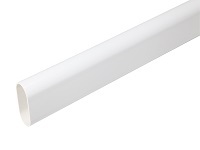 Our material, specifically rigid PVC exceeded and was certified to the requirements of BS 476: Part 7: 1987 (as amended) Class 1. 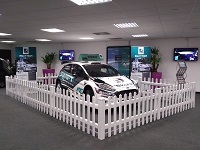 Sub-frame physical testing carried out by Lloyds British Testing Limited. Sub-frame and deck boards tested to 1.5 KN/M2 and onto maximum permissible deflection based upon span/360. Product reached maximum permissible deflection of span/360 at 2.1 KN/M2 including a safety factor of x 1.5. Ultimate load failure recorded at 20 KN/M2. 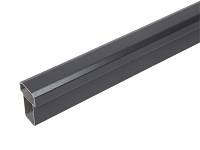 Cold rolled steel main frame profiles galvanised to British Standard BS EN 10346 : 2009. Sub-frame brackets are zinc plated and clear passivated to Fe/Zn25/A. Fensys balustrade system tested to the requirements of BS 6180 by independent accredited testers Lloyds British Testing Limited. 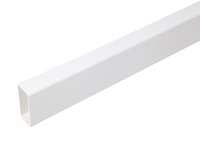 Testing carried out to confirm that the Fensys rail, bracket and post system achieved or exceeded the minimum requirements as set out in BS6180. Copies of test certificates, structural calculations and or certificates of conformity are available on request.